Welcome to Pinkfresh Studio April Essentials Release Blog Hop. 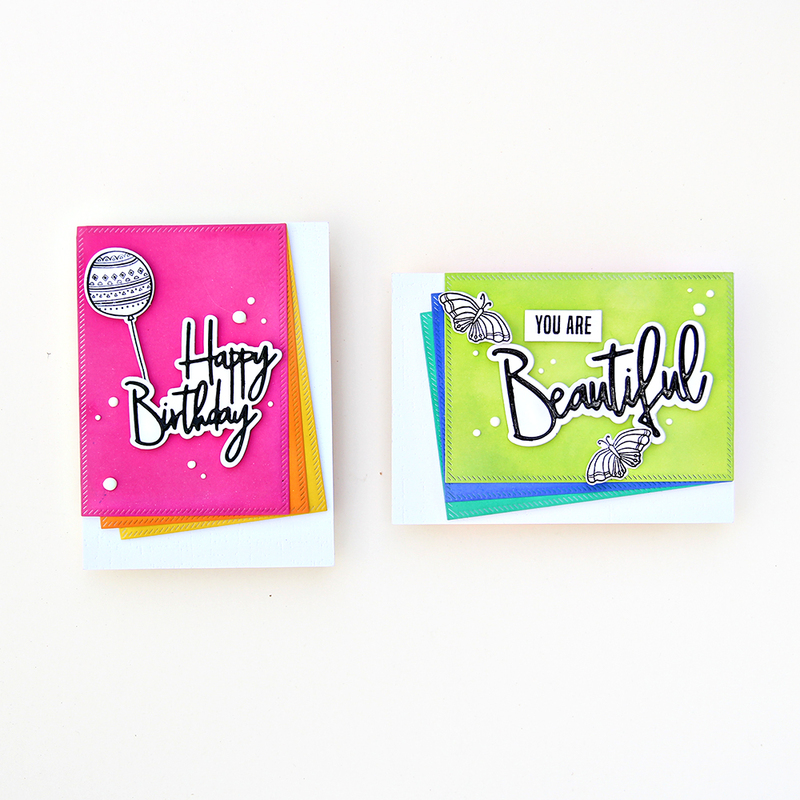 Today I will be sharing two similar cards featuring some new and older Pinkfresh Studio products. On both the cards I used the Diagonal Stitched Dies and the Classic Words Dies. I die cut the Diagonal Stitched Dies three times and inked them with distress inks. I die cut the word "happy birthday twice and stacked it up. Then I adhered it to the second fuller, outline die (which I LOVE) for interest and pop against the colourful background. I also stamped a balloon in black on white cardstock and tucked the string under the die cut sentiment. To finish, I applied some nuvo dots in white. I followed the same steps for this card too, just changed the colours and the layout. I always struggle in finalizing which colour combination should I go for. I know pinks and oranges look great in photos but I love these blues and greens more. So I just created two similar looking cards with colours that would look great on camera and also the ones that would make my heart happy! I hope you liked my simple, colourful cards! Pinkfresh Studio will be giving away the full April Essentials release on the Pinkfresh blog, and on their IG feed. There is a $25 gift card on all the stops of the hop. Winners will be picked from the comments left on the post. Pinkfresh Studio will post the winners on Sunday, April 14th on their GIVEAWAY PAGE. Please check that page & claim your prize within 2 weeks. Pinkfresh Studio will also be offering free/discounted shipping from April 8-11th on orders $50+. You must use the code APRESSFREESHIP50. Shipping is free in the USA, and $5.50 off for our International friends. I love, love, love your cards. Thank you for the ideas and inspiration. 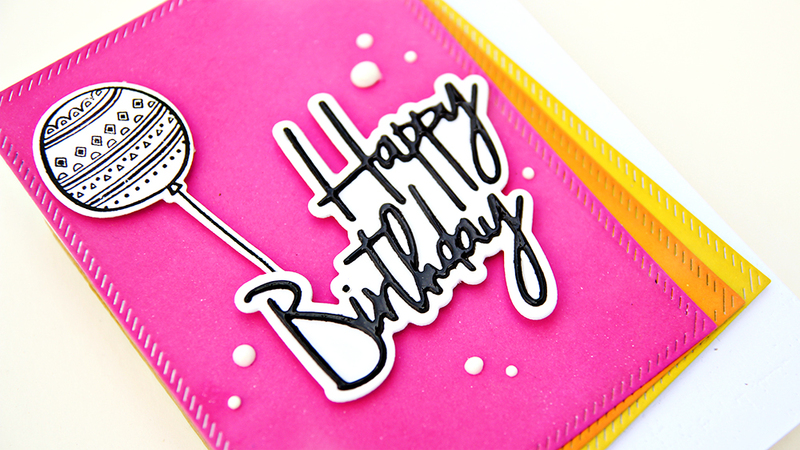 Wow, love both the cards with bright and cheerful colors, and the way you have kept the stamped image plain. I love your style. The happy birthday set are gonna be a must buy for me. Those background colors just POP !! Awesome set of cards. OMG! Can I steal this idea! I love the layered look and bright colors with the black and white font! GORGEOUS! These cards are so cute, very cheerful and sweet. Nice work! Bright, fresh, and beautiful, Erum! I cant see your full page, it’s cutoff. Such bright happy cards - love them! Those essential word dies really pop. Thank you for sharing your creativity! Bright, fun clean projects. I love them and this release! Awesome cards. It’s amazing what you can create by using word dies and changing the paper color. I like the pink and oranges together. They look so different and bright. The sentiment dies look really nice, and I like that you used black. Wow I love the bright fruity colors you used! Great cards! I love the bright colors and the dies you used. Erum I adore these bright and beautiful cards, love them! Thanks so much for the inspiration! Love the simple design of your cards. Also love the color combinations. Cute and colorful, without coloring! Love it! Yes, I love your cards. I was surprised to read that the colors are ink blended. They are so colorful and cheerful. Great use of the rectangle dies and word dies. Love these bold and beautiful cards. The colors are amazing with these fun dies. Great job! Fun cards! Love the pretty layered backgrounds and great new sentiments. Such bright and happy cards! Loving your cards, they look so vibrant. Nice use of the dies too. Wonderful job. Thanks for sharing your creativity! Love the bright and cheery colors. These cards are effective in their simplicity. Love the delicate sentiments. 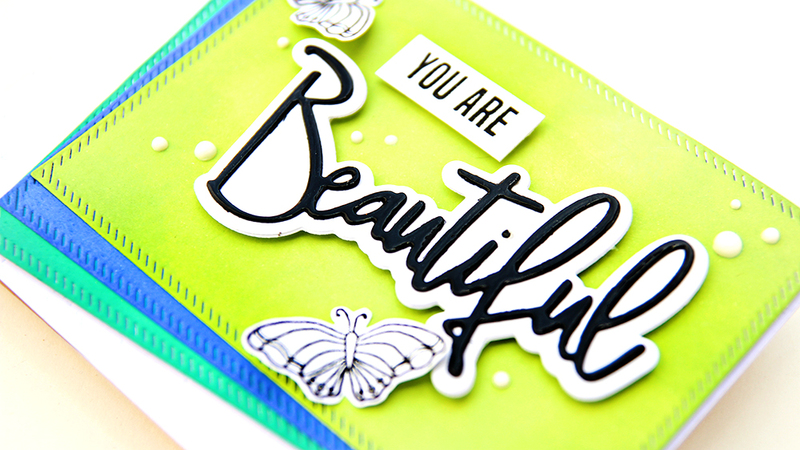 The bold sentiments and black stamping are stunning with the bright color schemes! How FUN are these cards? I LOVE the layering of the bright card stock with the black and white images. GREAT cards! Love the your bold color choices for the layered panels! Sweet, simple and colorful. Love these cards, love this release! I love your cards! What I love is the simplicity of just a few colors and they are something you could create in a matter of minutes if need be! I'm glad to see the diagonal stitched dies in action! What a great release. Love your cards. I love your bright colors and the way you've edged the cards! 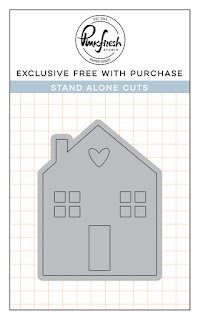 Holy moly, your simple die cut cards are stunning and perfect inspiration for quickies! Very nice and bright cards. 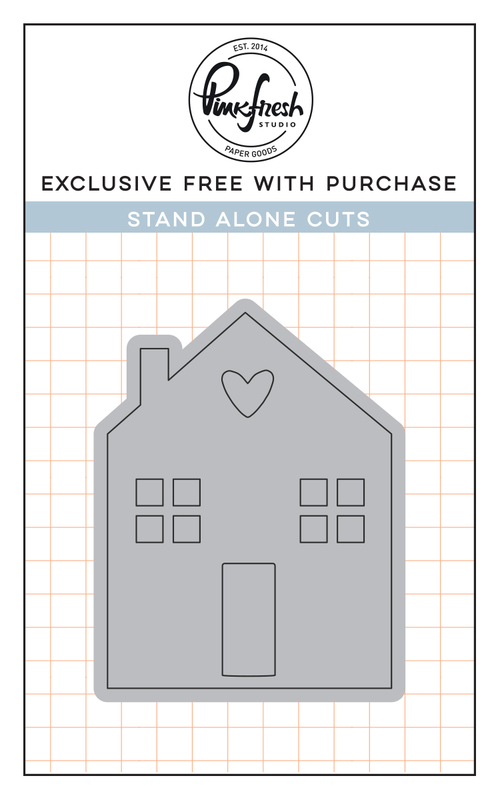 Love this new rectangle die with pretty slant design. I love the simple but effective design of both cards Erum and the colors are yummy lol (and they made my heart happy too). 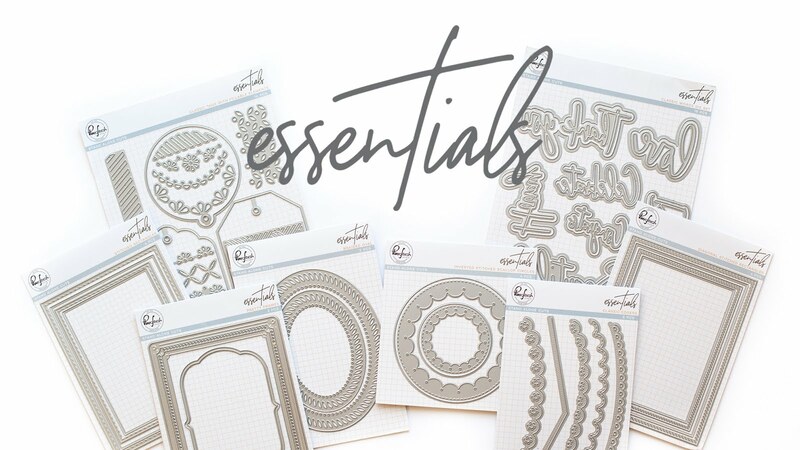 There are so many cool possibilities with this Essential release, I love it all!! Thank you for sharing both cards and the always awesome inspiration. Absolutely love the bright colorful clean and simple. Adds and the diagonal stitch rectangle is on my wish list ! I love the colors of your cards. They are very impactful and fun. I love the layered rectangular, colorful die cutouts. These are beautiful! The colors really POP! I love these bright cards! Thanks for sharing your ideas with these fun new releases. 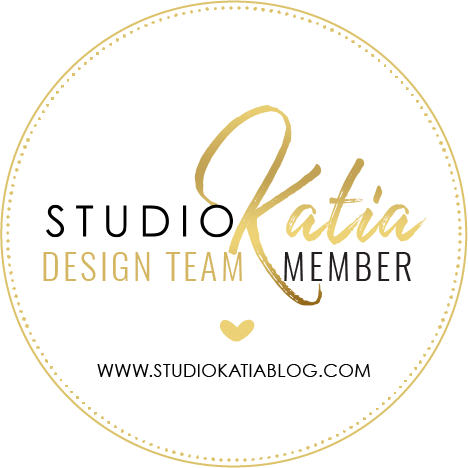 LOVE your cards -- came back to study it twice since I finished the blog hop. Disappointed the Classic Word Dies are not presently available... will have to wait for them. Thanks for sharing your style and creativity. 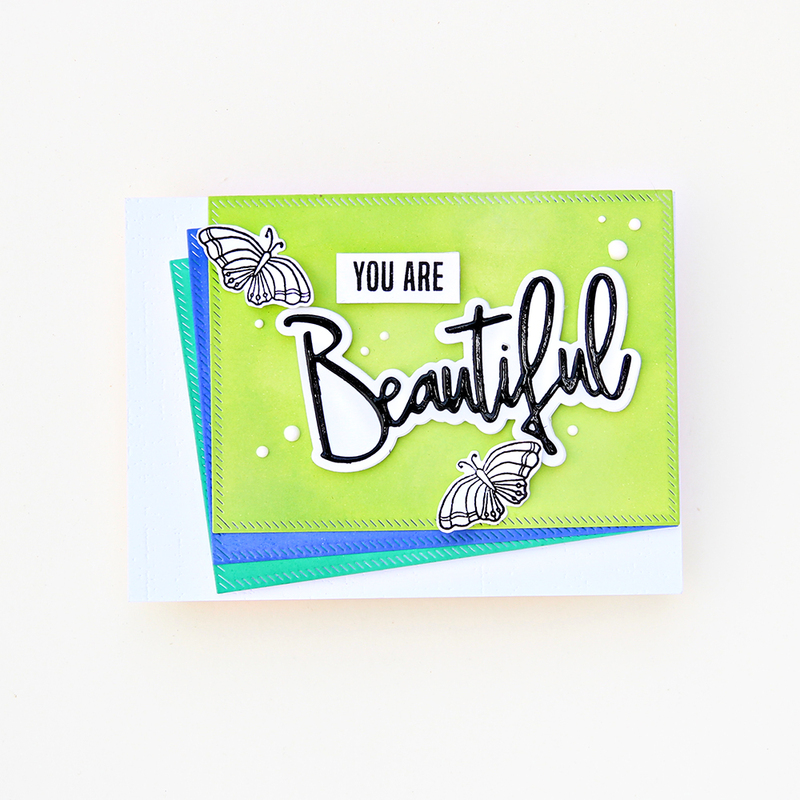 I love these bold and beautiful colors on your cards! So cheerful. great - the blue/green works well. Bright and Bold! Love these! Wow! So fun! 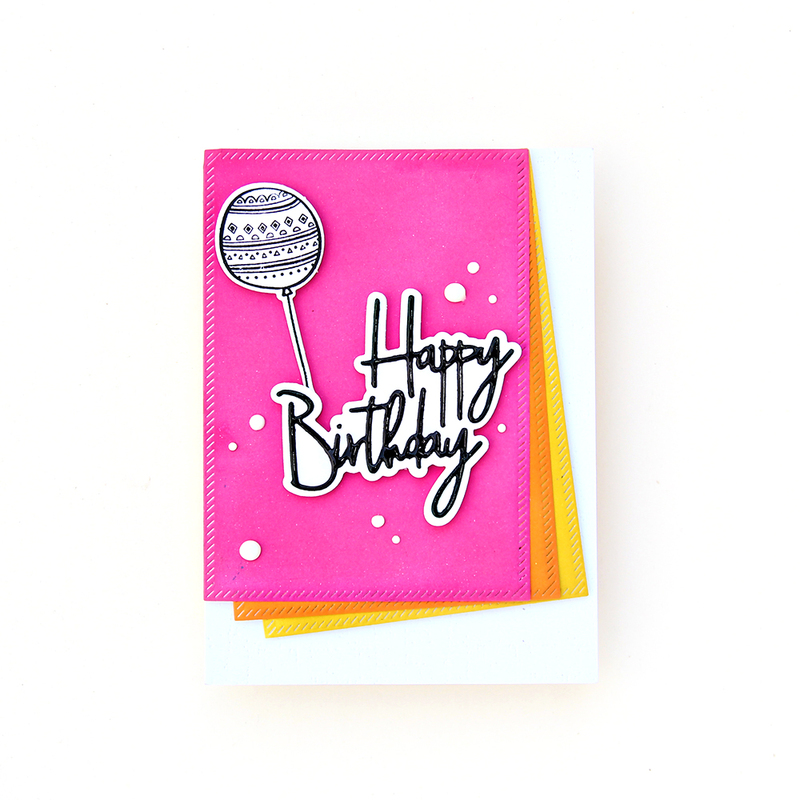 Love the simplicity of these cards with the bright colors! Such fun designs, I love the vibrant colours! I am in love with the new tags and words dies! 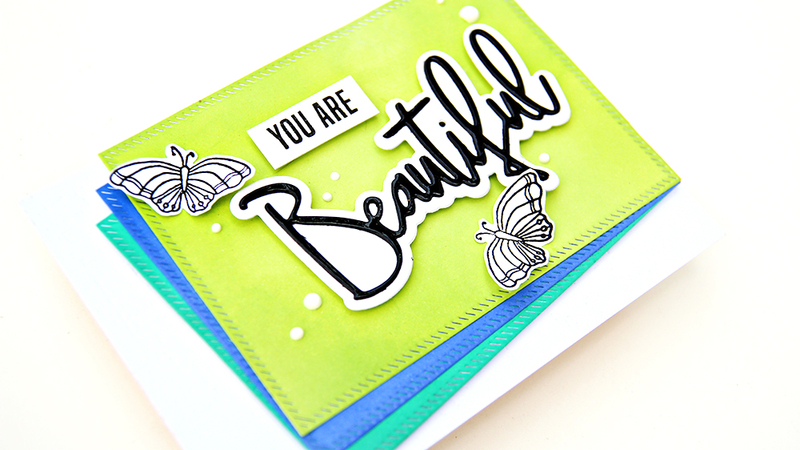 Beautiful cards, love the vibrant color combos to show off the cute stamps and fonts in black and white. 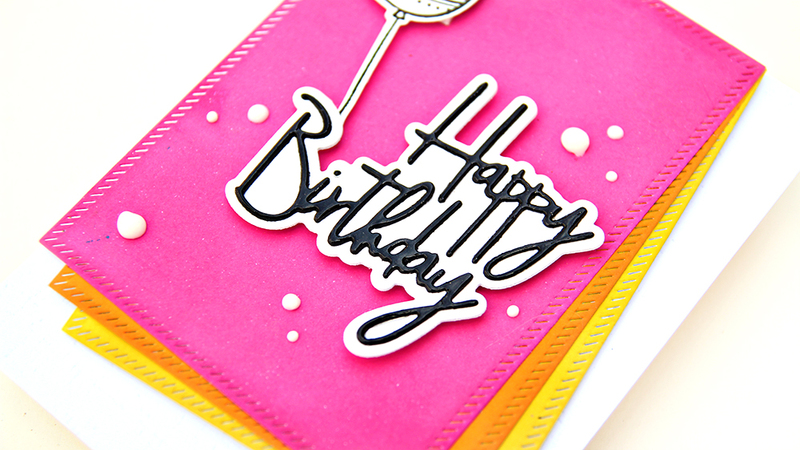 Love your bright and cheerful cards with the wonderful detailed edging. Love the diagonal frame and I think your colors go great together. Pinkfresh has loads going on in this release. So much to love. Thanks for sharing. Love the way you layered your bright and bold colors!!! Just fabulous!! Love the offset layers! Wonderful CAS cards. They are so bright and cheery. I'm becoming a fan of those word dies. I love your simple, colorful cards! These are right up my alley. And I'm glad you made the one that makes your heart happy. Those are the most important projects. :D Thanks for sharing with us! These are so pretty! I love the layering and the edge detail on the rectangle dies! Love your beautiful and colourful cards. This new release is amazing! Loving the look of the Diagonal Stitched Dies in such vibrant colors Erum! The cards are absolutely stunning! 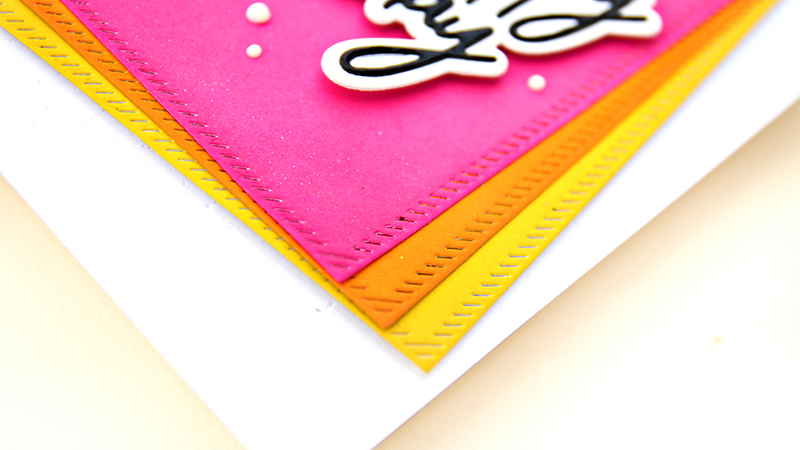 I love the combo of bright papers with monochromatic stamping. Looks super cool! The new release is fabulous. I really love the new sentiment dies. Your cards are awesome!! Love how bright and fun they are!!! How awesome!!! Your cards are so bright and fun!!! 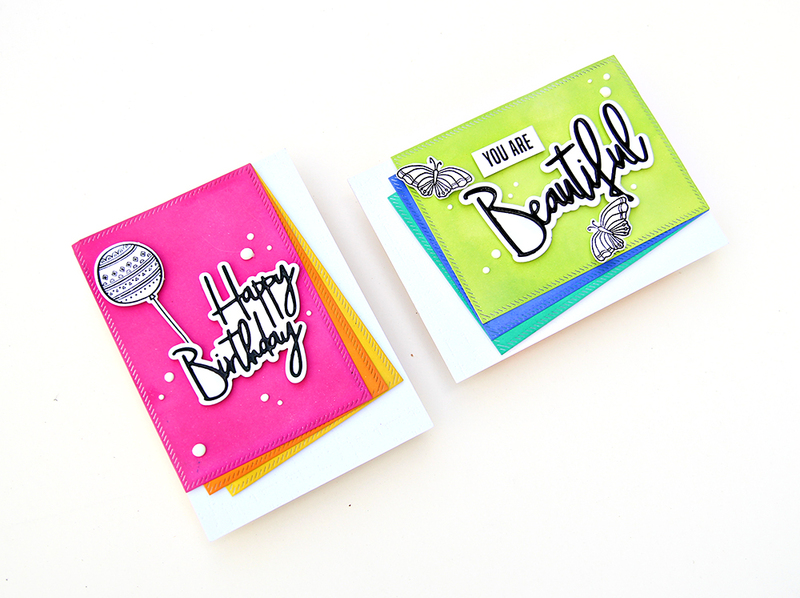 Gorgeous, bright and fun cards. I do like the Classic Word dies with the outline dies. Love these bright cards! They really show off the fabulous new word dies, love this font! Love your cards! So clean and simple! I really like all of your cards. They are simple, bright and perfect. Thanks for sharing. Cheerful, bright, and fun. These made me smile.